Posture & Joint Health: Don’t’ let Gravity Get the Best of You! Have you ever been told you have poor posture? Do you experience pain in your back, hips, knees or shoulders? Have you noticed that your head is forward of your body? Posture is more than standing or sitting up straight. Posture has to do with how well your body can work with stress, recover from injury or illness, heal, and function optimally. Imbalanced posture leads to numerous health concerns, including problems with your joints and even your internal organs. Gravity can wreak havoc on your joints if your posture is not in the best alignment. This creates pain and poor biomechanics that can lead to early degeneration. A common sign of this is when people’s head come forward of their shoulders and body. This condition is called “Forward Head Carriage” and is epidemic in our society. Forward head carriage puts abnormal stress on different areas of the mid-back and low back creating pain, discomfort, muscle tension and sometimes even numbness and tingling down the arms or legs. 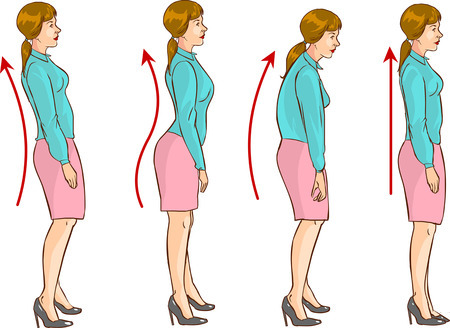 Forward head posture also puts significant stress on your spinal cord. The spinal cord is the bundle of nerves that connects your brain to your body. When there is stress on the spinal cord it tightens and begins to physically fray. That means that messages that travel down that cord from your brain to body (and back up) get distorted and sometimes even lost. Imagine the significance of this if one of those messages that gets lost tells your heart to beat rhythmically or your lungs to breath. Dr. Alf Breig, neurosurgeon & Noble Prize recipient, did extensive research in the area of spinal cord tension and found that, “Loss of the cervical (neck) curve stretches the spinal cord 5-7 cm and causes disease.” Loss of the neck curve occurs when the head comes forward of the body. Below is a list of causes of imbalanced posture and potential effects on your body. August is “Posture Awareness Month” at BodyMind Alchemy. I invite you to check out our free classes that we are providing to raise awareness of the importance of posture and its implications on your health. Please visit: https://bodymindalchemyboulder.com/events-calendar/in-office-talks/ to find out how to register. Anyone who comes to our talks this month will receive a free postural screening and computerized assessment! This entry was posted in Uncategorized and tagged aches, amanda hessel, arthritis, bodymind alchemy, boulder, chiropractor, colorado, forward head carriage, joint problems, muscle tension, nerves, nervous system, network spinal analysis, numbness and tingling, osteoarthritis, pain, posture, sciatica, spinal cord, spinal degeneration, stress. Bookmark the permalink. ← Inner work is Hard work: Why do I need to change or transform? Aren’t I already perfect?